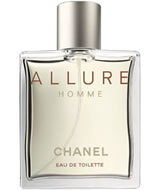 Launched by the design house of Chanel in 1998, Allure is classified as a refreshing, oriental, woody fragrance. This masculine scent possesses a blend of oriental freshness of bergamot with a trace of spice. It is recommended for office wear. It’s fragrant nature explores essences of bergamot, jasmine and cedar. Blended with notes of vanilla, sandalwood and amber.